Planning to race? Know the rules. Bending them could get you DISQUALIFIED. The primary mission of the CHIditarod is to harness the love and energy of Chicagoans to forge positive relationships and social good across our communities. The annual CHIditarod race aims to accomplish this goal by fostering a culture of mutual care and creative community engagement. Flagrant violation of these core philosophies will result in exclusion from the event; violations include, but are not limited to, disrespecting others or the property of others, displaying inappropriate racial or cultural stereotypes, participating in or promoting hate speech, enacting sabotage that borders on assault, and wasting food for sabotage or other ill-conceived purposes. Such behaviors bring harm to members of our community and are therefore harmful to all of us. All participants and volunteers are required to read and agree to uphold the core philosophy before participating in the event. Anyone and everyone should race, provided you are at least 21 years old. Spread the word by forwarding this web site to anyone you know. Does weather affect the race? Absolutely not. The race goes off rain or shine, blizzard, breeze or tornado. In 2006 it was 50 degrees and sunny. In 2007 and 2008 it was snowing. In 2014 it was in the teens and snowing. What does this mean? Two words: Be prepared! There is no bad weather, just poor wardrobe choices. Your dignity. Plus an entry fee. Check out our pricing and registration info. One of the best things about the CHIditarod is that there are tons of ways to participate and win. See our prizes page for the latest information on how you can be a winner at the CHIditarod. Please visit our registration page and follow all instructions carefully. Don’t jeopardize your chances of racing because you didn’t read all of the instructions. Registration is limited to 140 teams and closes on February 15, 2019! There will be NO race-day registration. That’s up to you. Each team receives a timecard & map of checkpoints they must go to in the order listed and not skip any checkpoints. Check in on race day starts at 9:45am and closes at 11:45am. The epic start to the race is at 12:30 pm SHARP. Each team chooses its own path between the start, each of the checkpoints, and the finish. Your team will stay at each checkpoint for 25 minutes before continuing on your journey. Should we also wear costumes? Absolutely. Definitely. Creativity is a huge part of this event. Wild costumes and insane themes are not required per se, but wholly encouraged. The most important rule of CHIditarod is… fun is mandatory. 95% of all teams have costumed themes. It’s epic. Pure street theater. Google around for past photos and inspiration! Please be tasteful with your costumes, it’s super lame if your costume could be construed as offensive. If so, you will probably be sent home. You have been warned. Something at the event has made me feel unsafe or unwelcome. What should I do? The CHIditarod shopping cart race is guided by a Core Philosophy of mutual respect, and we expect all participants to abide by that philosophy. If you see something that looks out of place or if someone at this event makes you feel unsafe or unwelcome, please report it as soon as possible. Reports can be made in person to any CHIditarod Core Organizer (“Coreganizer”). Coreganizers can be identified by their ARM BANDS printed with the CHIditarod patch emblem. If you have trouble locating one, you may approach any CHIditarod volunteer (like a checkpoint manager or a bike marshal) and ask for help finding a Coreganizer. Anyone wishing to make a report is welcomed to bring a friend for support if they would like to do so. You may also let the Coreganizer you speak with know if you feel that the report should be shared with an emergency contact or law enforcement. If you wish to make an anonymous report during or after the event, you may do so online by clicking HERE. We can’t follow up on anonymous reports directly, but we will do our best to investigate and take whatever actions may be needed to prevent reoccurrence. Anyone who violates our Core Philosophy and makes others feel unsafe or unwelcome reduces the value of this event for all who participate. We really, really, really want you to have fun at the CHIditarod. People like you make this day awesome. We’re glad you’re here. The CHIditarod is a food drive — 69 pounds per cart is required! In addition to being an outstandingly fun time, the CHIditarod is first and foremost a food drive. Your team must show up with 69 pounds of food or more to race in the CHIditarod! What is good food to donate? The Greater Chicago Food Depository requests that you please do not bring items in glass jars or any kind of candy or toiletries. 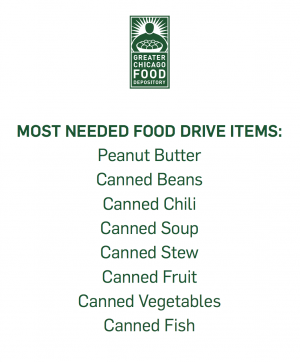 GCFD’s most needed foods are: peanut butter, canned tuna, canned chili, canned beans, canned soup, canned fruit, canned vegetables, canned stew, and canned fish. All items need to be non-perishable and shelf stable. Please do not bring anything in glass, cookies, muffins, cupcakes, chips, candy, dairy, fruit cups, anything breakable, or perishable goods. How do teams deal with the required food poundage during the race? Teams don’t. All food is collected at the start of the race. Bring your required poundage of food to the starting line. Before you can enter into The Yard, your food will need to be weighed at the Greater Chicago Food Depository truck. No team is allowed to finish their check-in process without the required poundage of food, nor will they be allowed into The Yard where all the cool things happen. We aren’t joking. Friends who come to meet you or watch can bring food themselves to donate. There will be donation bins at the starting line and finish line, but not at the awards ceremony. Remember – CHIditarod is a charity event, and there are substantial prizes for the teams that collect the most food. And please – high-protein non-perishable foods are preferred. We’ve collected a ton of food. Is there a way for us to drop it of before race day? Perhaps! Please email jen@chiditarod.org for details. Teams consist of exactly 5 people. The carts must be pulled doggie-sled style: four people in front with ropes pulling the cart (the dawgs), and one person running behind the cart steering (the musher). This configuration represents the theoretically ideal power-to-steerage ratio of 4:1, and must be observed at all times. Dawgs and mushers are free to trade off at the checkpoints. All team members must finish together – no stray dawgs! (Of course dawgs and musher may run free while they’re being watered at the checkpoints.) There will be Bike Marshals along the route to ensure proper form, function, and of course, safety. No facemasks at the starting line, checkpoints, or finish line. No assisted movement other than your own feet (sorry roller derby girls – we still love you). You must respect all local laws and ordinances, including those governing traffic, littering, dumping, alcohol consumption, and theft, for example. Can we try to prevent other teams from winning? i.e. SABOTAGE? Yes, with limitations though. You MUST READ the Sabotage Rules for the full schtick. Can I SABOTAGE other teams? This bears repeating…you MUST READ the Sabotage Rules. Can we use public transportation? No. That is cheating. Cheating is not allowed. Can we use private transportation? Can I bring my real dogs? The judges have final say over all prizes and winners. This is complete and final. Judges have sole discretion over all points awarded or deducted, prizes awarded, which prizes are being awarded, race rules, all laws of physics, what time it is, and what happened in the past, all of which are subject to change without notice. Each team must complete the race in the order specified on their route map (received the morning-of at registration). When you arrive at your checkpoint, 4 team members must be there to checkin. Check in with the cart wrangler who has a bright yellow/green safety vest on. They will have something for you. You will need this something to finish your checkin at the bar. Once you receive this special something, go inside and hand this special something along with your race card and give it to the checkin person (look for laptops). At every bar there are fun contests for you and your teammates. These are not required but a large piece of the fun and excitement about CHIditarod. We HIGHLY recommend you participate. Yes, you read that right… bribes. Checkpoint volunteers love being bribed for numerous amounts of things. No volunteers at CHIditarod, bike marshals included, can require a team to bribe them, BUT! bribes do help grease the wheels of the volunteers, and could help you land some sweet prizes. 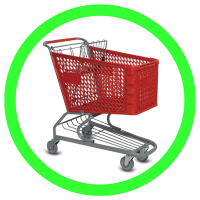 Does my team need to provide our own shopping cart? Yes. No exceptions. It must be a standard grocery-sized shopping cart – none of those half-length/double-decker carts, child-sized carts, or those fold-up “carts” often piloted by adorbable Grandmothers. Where do we get a cart? 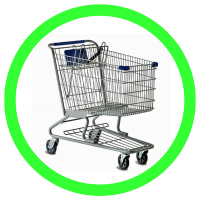 There are many places where one can acquire the standard grocery-sized shopping cart that you will need to participate. Ask your local supermarket if they will lend you a cart for “probably the world’s largest mobile food drive.” They will be glad to participate in this unique event. Give it back to them as a work of art after the race. Or if they prefer, return it cleaner than you found it. You may also purchase a cart. Try searching on google. Some companies sell used carts, too. Please do. Everyone does. We want yours to be awesome. There are some rules — kind of like stock car racing — and they differ slightly depending on whether or not your team chooses the Racer or Art Cart category. All designs must be made with full regard to both safety and all relevant civil, criminal, and physical laws. All carts need to fit onto the sidewalk (this is a pedestrian race). All four “dawgs” must pull the cart with ropes of some sort. In case of deep snow or treacherous ice, you can attach some sort of sled substructure to the bottom of the cart. You can attach things to your cart, make a riding platform, and grease up your wheels. You can also chop up the cart and rearrange the pieces — but they all have to be attached somewhere else on the cart. All original pieces must be accounted for. Ensure you consider ground & curb clearance. 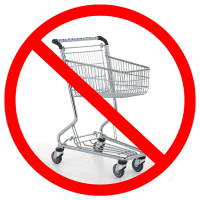 Your shopping cart cannot be motorized, nor can you use any type of bike/pedal structure for propulsion. You must use a normal-sized cart, i.e. not one of those baby carts from Whole Foods. No exceptions. Your shopping cart must roll on at least 4 normal, standard-issue shopping cart caster wheels. Your cart should be able to fit (with whatever effort necessary) through a regular front-door-sized opening. An Art Cart is a unique creation that is radically stunning, and heavily modified from it’s original cart form, (usually) permanently. Art carts embody the creative spirit of their creators and the CHIditarod, and stretch the limits of cart-based art in dynamic, engaging, and safe ways. Art Carts were introduced to Chiditarod in 2010. Racing as an “Art Cart” is a more “free form” category for those teams wanting to stretch their creative muscles outside the parameters of racing. Some examples would be really big wheels, grill/food carts that don’t want to run everywhere, a multi-franken-cart mechanical extravaganza, etc. 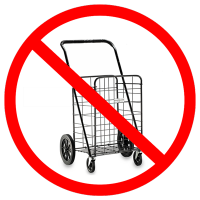 There are some differences between what’s allowed for Art Carts and regular shopping carts in the Chiditarod, so be sure to read The Rules in full before deciding if your team wants to do an Art Cart. Art Carts don’t have to fit through a standard-size door frame. Art Carts can use non-standard wheels and different sized carts. Art Carts can have mechanical aspects, but can not have mechanical propulsion. You have “roaming privileges”, meaning you aren’t required to hit EVERY checkpoint. You will be required to hit certain checkpoints (your race card will tell you). You cannot win any prize based on race time, finishing position, or sabotage. However, you can win other prizes and there is a special prize for Best Art Cart. You cannot sabotage. Period. Unless you like disqualification. You still have to bring the required food drive poundage to the starting line, start the race with everyone else and cross the finish line at a reasonable time. You still need to register and do a cart deposit like everyone else. Admission into this category is not automatic and requires our approval. There will be a cap on the number of Art Cart participants in this category. If you are interested, register ASAP with a description of your Art Cart idea in the comments box and we’ll get back to you with the judges’ decision on inclusion. If your entry for an Art Cart is denied, you can re-apply or race traditionally. Remember, registration is first-fully-completed, first-served. To save our sanity, we will stop processing Art Cart registrations EARLY. What is the cart deposit? There is a $88 cart deposit, which you will pay during registration. Why? Because this is a LEAVE NO TRACE event and you must prove without a doubt that you took your cart home with you after the race. This means photographic evidence of your cart in it’s natural environment, at the minimum. Does my cart deposit mean you will provide me a cart? No. Never. You MUST provide your own cart. Since you’ve read the rules, you know that (a) every team needs to bring their own pimped-out cart, and (b) every team needs to pay the cart-deposit, which is fully refundable per the instructions below. During check-in you will receive a Bib Number. You MUST attach this bib number to the front of your cart. Plan for this, it is important for you to receive your refund. You will also receive a “cartvixen card” in your racing packet that has directions. All crucial instructions for receiving your deposit back in full are on this card, so it’s worth $88 – you should keep track of it! All proof must be submitted within ONE week of the race day. Because Coreganizers have lots to do post-race (and we’re all volunteering our time), the cart refunds may take up to 2 weeks to process (more carts left behind = more delays in refunds). Please be assured that all refunds will happen if you send us the evidence we asked for. Any leftover cart deposit monies from teams not responding and/or deserving of being added to our wall of shame will be donated to the charity after covering race costs. We love volunteers who help clean up post-race, join us the day after – we love us some fresh reinforcements! 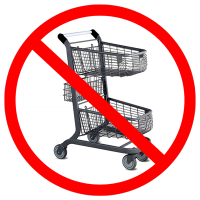 What if we abandon our cart? 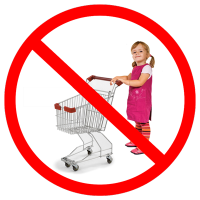 If you abandon your cart, you forfeit your cart deposit. No exceptions. Your cart is your responsibility. Take the cart back to a supermarket. Donate it. Gift it. Just don’t abandon it. Why does the cart deposit exist? CHIditarod is a LEAVE NO TRACE EVENT. This includes your cart. Carts have been abandoned enough times to force creation of the cart deposit, which has significantly helped reduce abandoned carts. If you haven’t figured it out, we take this VERY SERIOUSLY! Plain and simple: TAKE YOUR CART HOME with you after the race. AND.. don’t lose any instructions you receive. We understand that you may be hung-over, but that’s not an excuse to burden race organizers, and our neighbors, with your mess. Can I store my cart somewhere overnight and pick it up the next day? Actually, yes! The Starting Line and the Finish line are in the same geographic location. You will be able to leave your cart at the finish line overnight! If you would like to take your cart home on Saturday (Race Day) you must remove it from the yard by 6:30 pm. The gate will lock at 6:30pm. The gate will be open again on Sunday from 12 pm – 2 pm. At 2:01 pm the gates lock and you have forfeited your cart deposit. While you may be hungover, we are too and by Sunday we’ve been rodding for about 70 straight hours. You may not dismantle your cart in the yard. There is nowhere for you to leave trash, remember this is Leave No Trace event, so come prepared to take all of your things with you. Please make sure to follow the Cart Vixen’s instructions, and take a picture of your cart with the card. This card is located inside your handy racer packet that you receive at checkin. A copy of the card will be located under the page Racer Resources.